KTMtwins.com KTM Motorcycle and Product News: KTM 950 Adventure, 950 Super Enduro and 950 Supermoto High Flow Airfilter now in stock! KTM 950 Adventure, 950 Super Enduro and 950 Supermoto High Flow Airfilter now in stock! I know everyone has been waiting and so have we. BMC has finally shipped out the anticipated 950 version of their high flow airfilter. 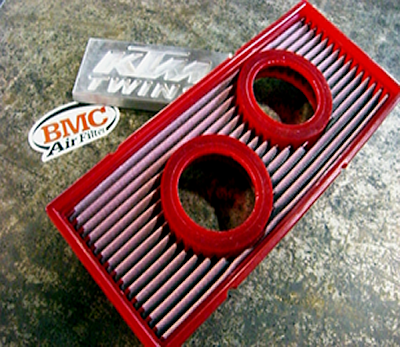 We are currently sitting on stock of these popular BMC High Flow Airfilters. If you have a 950 Adventure, 950 Super Enduro or 950 Supermoto do yourself a favor and pick one up today before they get sold out again.